Raymond Bernard's From Christ to Chrishna is a book from the past which has made its appearance again. It seems to have first been published by Health Research in 1961, although the forward by the author is dated 1959 and the copyright dates from 1966. The book has recently been reproduced by Health Research. The name Raymond Bernard is said by Dennis Crenshaw to be an alias for the surname Sigmeister. Dennis has extensively researched this author because of his other writings, writings on the hollow earth theory. For example, Bernard penned the book Agharta, on the Tibetan underground, and most notably The Hollow Earth, which has become a standard-bearer for the hollow earth community. Right from the very beginning, From Christ to Chrishna establishes that the teachings of Krishna are the origin of Christianity. The book explains that Apollonius of Tyana had studied in the Himalayas and that he returned and introduced these teachings to the Essenes, who became the first "Chrishn-ins", later Christians. It brings to our attention that the writings of Apollonius were re-written and plagiarized by Roman churchmen at the Council of Nicea three centuries later. In the fourth century, A.D., Hierocles accused the Christian priesthood of this plagiary and of inventing a messiah by combining the name of the Druid sun god, Iesus, from the Western half of Constantine's Roman empire with the name Chrishna, from the Eastern half, which had become corrupted to Christ by that time. In order to provide historical justification, the book explains how a Jewish religious teacher from Jehoshua Ben Pandira was selected, and why a young Essene who had been crucified, Jeshai Beth Halachmee, became incorporated into the story. The book adds authority to its assertions by interpreting the research of academicians from the past, such as J.M. Roberts, who authored the book Antiquity Unveiled; Reverend Robert Taylor, who authored Diegesis; Moor, the author of Hindu Pantheon; Gerald Massey, of The Natural Genesis Godfrey Higgins who wrote Analcalypsis and Professor Hilton Hotema, among others. From Christ to Chrishna acknowledges the book Monumental Christianity as the source of the illustrations which it contains. Bernard utilizes comparison as a device for establishing that the birth of Christ originates from the older, Sanskrit-documented narration of the birth of Krishna, as found in the Puranas. 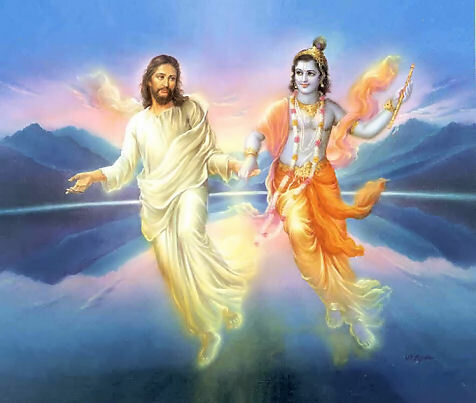 Shree Krishna, for example, was born in Mathura but taken to a pastoral setting just after birth- Christ was ready to be born in the larger city of Nazareth but taken to a pastoral setting just before he was born. At birth, the devatas showered flowers and sang hymns in glorification of the baby Krishna, just as it is related in relation to the angels and Christ in the Gospel of Luke. After His birth, Shree Krishna was visited by a wise man, the sage Narada Muni who foretold his future according to the alignment of stars at the time. This is similar to the way in which Jesus was visited by the Magi who had followed a star in the heavens in order to find him, and who also foretold of His future glory. In the natal story of both Shree Krishna and Christ it is told that the regent ordered the death of all male children bon during that period- in the birth story of Shree Krishna, the regent's name was Kamsa. In the birth story of Christ, it was Herod. Bernard quotes Sir William Jones, a respected Sanskrit scholar, in this regard: "That the name of Krishna and the general outline of his story were long anterior to the birth of our Savior, and probably to the time of Homer, we know very certainly ." There is much, much more along these lines. Whether or not the reader accepts every last shred of evidence, and every last explanation by Bernard is immaterial. Bernard presents a scope which is broad enough to substantiate the Krishna origins of Christianity. It is almost ironic that when this book was written, the Indian/Hindu immigration into North America had not yet taken place. Even the Indian population of Great Britain was not what it is today. Even so, the book is very appropriate for the bookshelf of any current follower of Vedic dharma as it provides orientation in a Christian world which can be aggressive at times. The above Bible revelation sounds so much like the incarnation of Lord Kalki that it could hardly be anyone else. Surely, by the time Lord Kalki appears, no one will have the slightest expectation of Him or His appearance. No one will know His name. And His army of brahmanas will be as pure as if they had descended from heaven. At the time of Lord Kalki's appearance, He will kill the remaining miscreants and deliver the few saintly people from the present conditions of the earth, changing it back to the Golden Age of Satya-yuga. "Lord Kalki, the Lord of the universe, will mount His swift horse Devadatta and, sword in hand, travel over the earth exhibiting His eight mystic opulence's and eight special qualities of Godhead. Displaying His unequalled effulgence and riding with great speed, He will kill by the millions those thieves who have dared dress as kings." Please Read: The Apocalyptic Horse Rider - Appearance of Kalki Avatar. 16. John P. Lundy, Monumental Christianity (New York, 1876), p. 151. 18. T. W. Doane, Bible Myths (New York, 1882), p. 286. 19. Williams, Indian Wisdom, or Examples of the Religious, Philosphical, and Ethical Doctrines of the Hindoos (London, 1875), p. iv. 20. Cox, The Myths of the Aryan Nations (London, 1870), vol. 2, p. 138. 21. Maurice, Hindostan, vol. 2, p. 316; Luke 1:57. 22. H. H. Wilson, trans., The Vishnu Purana, A System of Hindoo Mythology and Tradition (London, 1840), book 5, chap. 3; Luke 2:1--7. 23. Cox, vol. 2, p. 107. 24. Godfred Higgins, Anacalypsis: An Enquiry into the Origin of Languages, Nations and Religions (London, 1836), vol. 2, pp. 98--99. 25. Farrar, The Life of Christ (New York, 1876), p. 38. 26. Mons Dupuis, trans., The Origin of All Religious Worship (New Orleans, 1872), p. 134. 27. Swain, vol. 1, p. 259. 28. Thomas Maurice, History of Hindostan (London, 1798), vol. 2, p. 319; Matthew 8:2--4. 29. Maria L. Child, The Progress of Religious Ideas through Successive Ages (New York, 1855), vol. 1, p. 68. 30. Maurice, Hindostan, vol 2, p. 320. 31. Maurice, Indian Antiquities (London, 1794), vol. 3, p. 46; John 13:5. 32. Charles Wilkes, trans., The Bhagavat Gita, or Dialogues of Crishna and Arjoon, in Eighteen Lectures With Notes, (London, 1785), p. 51; John 13:23. 33. Williams, Hinduism (London, 1877), p. 211. 37. Swain, vol. 1, p. 237; I Peter 3:19. 40. Higgins, vol. 1, p. 144. 42. Inman, Ancient Faiths and Modern (London, 1868), vol. 1, p. 411. 43. Child, vol. 1, p. 71. 44. Dupuis, p. 240; Matthew 28:6. 45. Child, vol. 1, p. 75; Williams, Hinduism, p. 108.